Conservative Warner Todd Huston at It Again. This Time Attacking Batman and Muslims. Conservative/Right-wing blogger Warner Todd Huston is at it again. You might remember Huston as one of the right wingers who lead the over blown charge that Captain America was anti-Tea Party. Huston has taken up the right wing’s latest anti-comic book cause, attacking Batman‘s recruitment of a Muslim to don the cape and tights as part of the franchising of Batman. Writing for Canada Free Press (was there no Canadian to do this dirty work?) Huston argues this is the latest “PC indoctrination” to hit comic books. While Huston is correct in the current tensions between Europeans and Muslim immigrants it’s what he equates this plot line to that’s the telling point. But we’ll get to that later. It’s PCism run amuck, for sure. But it isn’t surprising for DC, a comic book company that has a character whose creator based it on “corporate greed.” Nor is it surprising in an industry where tea party members are made the enemy of super heroes. For the character based on “corporate greed” look up DC’s Larfleeze character and see the Marvel comic Captain America issue 602 where The Captain makes Tea Partiers into an enemy to America (Marvel later apologized). For that matter, check out the words of the director of the new 2011 Captain America movie who said that his Captain America won’t be a big “flag waver.” Imagine that. Captain America not being that into America. These few examples aren’t the only ones, either. Among many other instances, last April the venerable Archie Comics announced they were adding a gay character and back in 2007 movie makers announced that they intended to remove all mentions of the U.S. military from G.I. Joe (they later relented to a degree). It all adds up to a PCing of the American comic book industry that has been going on for far too long. Yes, you see that bold. Huston equates Batman recruiting a Muslim character to join his crusade along the likes of having ONE gay character in your comic book. These are both injustices in Huston’s world and to conservatives as a whole. Gays, Islam, especially in a positive light, are taboo. Both should not be mentioned, in hopes they’ll go away. What Huston isn’t saying is, he dislikes anything that doesn’t espouse his conservative views. God forbid a character is Muslim. Let alone an Algerian Muslim in France. Huston also seems to forget France has a tradition of riots. I’m pretty sure all of them weren’t by Muslims. The comic book is written by a British writer. Who I’m going to guess has a better perspective on European affairs than an American conservative blogger. But that’s the issue with the right, they feel their view shouldn’t just be the view of America but also the world. The right as a whole has an issue with Muslims in comic books. This is just another salvo to them and another example of comics reflecting the very real multi-cultural and connected world. So the comic mentions riots? Did I just read Huston’s own commentary right? So Huston is angry that it shows a Muslim in a positive light? Is that the issue? But lets look at the most idiotic of statements. 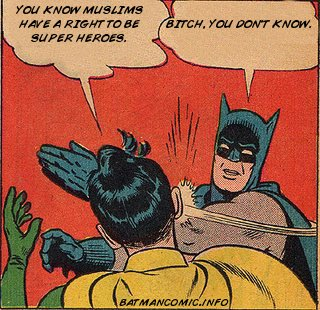 You see, DC Comics has decided that the “French savior,” the French Batman is to be a Muslim immigrant. What’s the issue here? Can’t a person protect their adoptive country? Why must every “national hero” be native born and bred? Is it the issue he’s a Muslim? He’s an immigrant? He’s a Muslim immigrant? If it’s the religion, that’s pure bigotry. If it’s the fact he’s an immigrant, then I sure hope every American super hero is Native American. As blog Death and Taxes points out. Nightrunner illustrates the natural inclusion of a very real group: Muslims make up about 6% of the population, and an estimated 1.5 million of those people hail from Algeria, a country France occupied for over a century. So really the story is about a young man who’s people were occupied by a nation rising up to defend that nation. This is a bad thing? What’s comical is Huston’s other targets. He clearly dislikes gays, why then even mention Archie? If comics are a reflection of the real world as Huston wants by acknowledging French/Muslim tensions, then surely one gay must exist in the world of Archie? But no, one is too many for Huston. He also cites Larfleeze, the Orange Lantern. I can’t say I agree with that interpretation. He represents GREED, period. Drop that word “corporate” from there. I’m pretty sure the Bible mentions it as a sin. So, is that now PC too? The concept of the various Lantern Corps.’s powers is based on emotions. In Larfleeze’s case the Orange Lantern is powered by avarice. insatiable greed for riches; inordinate, miserly desire to gain and hoard wealth. And as expected he picks and chooses quotes to attack comic books and ignores facts (and even cites the G.I. Joe movie. I’ll repeat movie. A movie that was a animated television show and toy before it was a comic book). If you actually hear the director speak on the topic the issue is international distribution. A movie needs to sell overseas to be profitable. Especially a big budget one. By having the movie a very pro-American, jingoistic movie, the likely reception will be cool and it won’t sell well outside of the United States. That decision is about profits and the dollar. I thought conservatives were pro-corporations? Huston seems to focus on these riots and the cause of them. Sure, there’s riots caused by disaffected youths. A simple Google search of “French riots” shows these stories. But the bigger point is, that’s not this story. Maybe that will be mentioned later, but that’s not the focus of what David Hine wants to tell during this issue (I haven’t read it). Forget the riots though, that’s just a smoke screen. Boil down Huston’s rant and it’s this. Some Muslim youths riot. Some of those Muslim youths are immigrants. Those Muslim youth are bad. Thus, all Muslims are bad. A Muslim immigrant is really bad. A Muslim can’t be a hero. That is his twist if A then B logic. If it’s not, then why can’t he support one character rising above the “bad influences” around him and doing good? I’m sure he or she can, as long as they’re not Muslim.